Hi my name is Red and I am a puppy dog. Just 1 year ago from today I was adopted by this crazy but sweet couple who live north of the Mason Dixon Line. You see I’m from Kentucky, I was born in a ditch with my brothers and sisters. We don’t know what kind of dog I really am. My Dad Christopher calls me a “Voodoo Hound Dog”. I like it. Makes me sound mysterious with the ladies at the park. More about me later because I’m too excited to tell you that I already got my first gig as a camera operator! 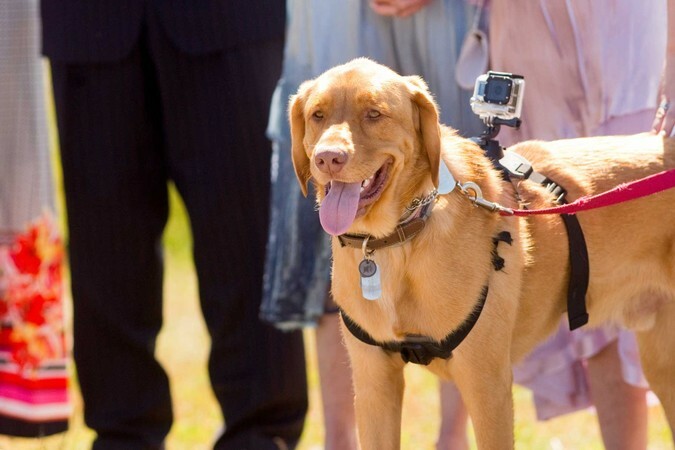 On June 18th I had the privilege of being the Go-Pro Camera operator at my parent's wedding. It was (as you yankees say) “wicked fun” I got to ride in a convertible and wear this cool harness with a camera attached to my back. They even gave me a ton of treats for just “being good” whatever that means AND got many pats and ear scratches from cute girls that were there at the wedding. It was at Odiorne Point in Portsmouth NH right on the ocean. There were lots of seagulls and I wanted to chase them but I was on the job and my Dad told me that that in this biz “you’re only as good as your last job” so I stayed put and got some great footage knowing he would let me chase them all I wanted later. I really had a great time shooting and being part of the wedding. It got me thinking about what other things I could capture with my new harness and topics that I would like to cover. If you guys have any ideas please let me know! Ruuuuph!